I was shocked, at first, and then started a very heated discussion about that this was not what I was talking about. Somehow during this discussiond I spilled coffee from my mug over the manager. 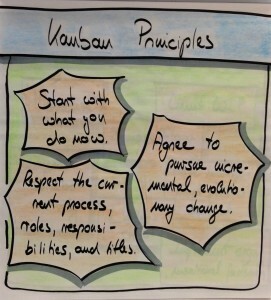 People later told me they had the impression I was attacking the manager with coffee – to defend Kanban of course! But what happened? 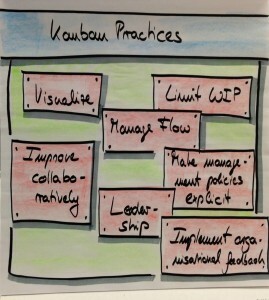 The thing is, you could actually implement Kanban in a very bad command-and-control-ish way. But that’s harder with values in place. For example, “visualizing your workflow” is a practice which can be implemented in a very command-and-control-ish way. But if you had the value “respect” tied to this practice, then this would lead you more naturally to a self-organizing way. This is my text of the 99 Second Presentation session of the Limited WIP Society Melbourne tonight. This format was invented by Scott Berkun, you could do a presentation with two constraints: the presentation shouldn’t be longer than 99 seconds, and you are allowed only a single slide. I couldn’t wing it, so I read out the story. It worked, I guess. I prepared the three slides you see in this post. Thanks to Ed Wong, who pointed out that I only can use a single slide, I used just the one with the values. I was among several other presenters; Ben Hogan also blogged about his presentation, [update: and you can find the content of Craig Brown’s presention on his blog, too]. All in all a nice experience. Kudos to the organisers, especially Jason Yip! 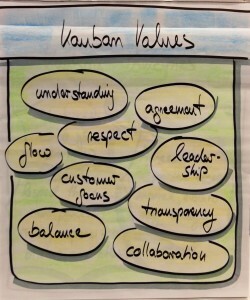 This entry was posted in General and tagged kanban, management. Bookmark the permalink.